A couple of weeks ago, KCNA carried a report of Kim Jong-un’s oversight of a grand, general reconstruction plan for Sinuiju, North Korea’s most important hub for trade with China. North Korea, it seems, expects that trade primarily with China will continue to grow and remain the country’s most important source of foreign currency revenue for the foreseeable future. This is something to keep in mind through the speculations about US and other western investments in North Korea in the event that sanctions are lifted and denuclearization (whatever version of it) comes through. The plans for Sinuiju are also notable simply because Sinuiju is not Pyongyang. There has been quite a bit of work done in the past few years, under Kim Jong-un, at extending the renovations drive and infrastructure construction to smaller, provincial cities (mostly provincial capitals). One message seems to be that Kim Jong-un’s ambitions and promises of economic development aren’t just for the elite, but for the population as a whole. It’s unclear how the plans that Rodong speaks of are related to the Sinuiju International Economic Zone. 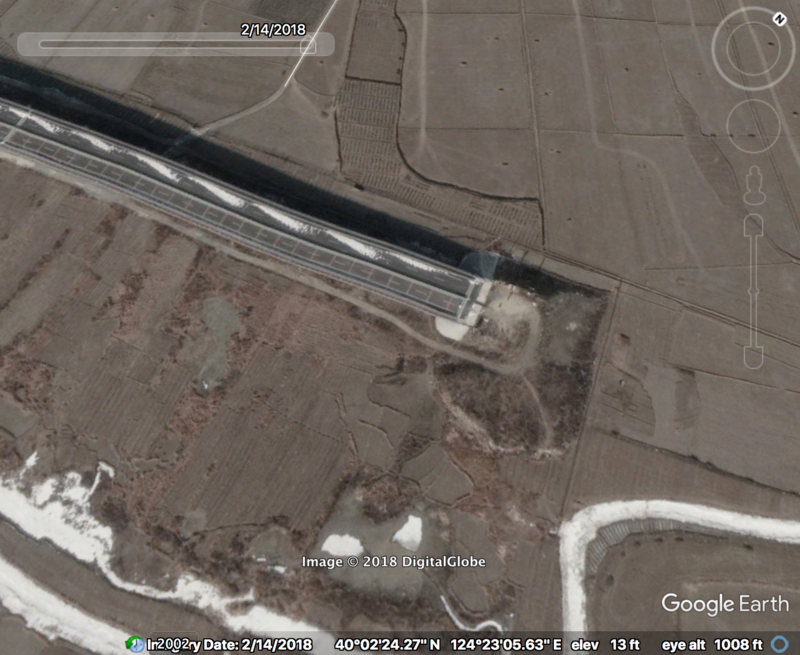 An issue of the quarterly North Korean magazine Foreign Trade in 2015 indicated that renovations of Sinuiju would focus on infrastructure renewal, but as the example of the bridge to nowhere shows (see below), it’s unclear what actual progress is being made in reality on this. Pyongyang, November 16 (KCNA) — Kim Jong Un, chairman of the Workers’ Party of Korea, chairman of the State Affairs Commission of the Democratic People’s Republic of Korea and supreme commander of the Korean People’s Army, examined and guided the master plan for Sinuiju City together with leading officials of the party, administration and design organs of North Phyongan Province. “The present era” = likely, the era of a growing middle class with demands for consumption and entertainment, many of which make their money through the markets and semi-private business. This all sounds very expensive. Meanwhile, North Korea faces largely unfunded humanitarian needs, which could be met relatively cheaply. In fact, the equivalent of one-sixth of North Korea’s total luxury goods imports in 2017 would be enough. Speaking of infrastructure: this is the only part of the article where infrastructure is mentioned. It is interesting and notable that despite the attention and grand plans for Sinuiju, the new bridge connecting the city to Dandong had still not been connected to North Korea’s road network as of mid-February this year, as far as I can tell from satellite imagery. This is the most recent date for which imagery is available. The end of the new bridge from Dandong, on the North Korean side. Photo: Google Earth. Underlining the need to pay deep attention also to the creation of cultural environment including urban greening, he called for creating green belts near the city’s main road and around the industrial area to make sure that one citizen has 50 square meters of green tract of land, and for building city park, botanical garden and recreation ground in a cozy and peculiar manner to suit the specific conditions of the local city. Again, that’s going to cost a lot of money, and not least, human effort. Citizens might be happy about green spaces, but they’ll be less so at having to go out and construct them through “voluntary” labor. Noting that it is most important in urban construction to make sure that citizens don’t feel any inconvenience, he said that it is necessary to increase electricity production and make a maximum use of natural energy so as to round off the city electricity supply network system, perfect the heating system, put the water supply on an international standard and properly establish the system for purifying industrial waste water and sewage as the city has dense arrangement of residential quarters and industrial establishments. Electricity and energy supply is one of the main achilles heels for the North Korean economy, and its industry is highly vulnerable to shortages in electricity supply. “Maximum use of natural energy” sounds like hydrogen power to me, which is North Korea’s most plentiful source of electricity. Aside from coal, that is, but given the export value of coal, its use for domestic electricity production comes with a high opportunity cost. 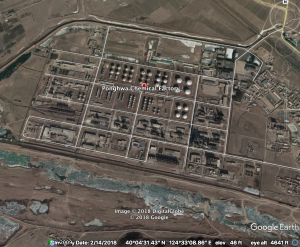 In any case, the North Korean administration is clearly aware (and has been for decades) that energy is a big problem, and bringing it up in conjunction with a city plan inspection is likely a way of sending the message that the authorities are working on it. How exactly that is being done is less clear. 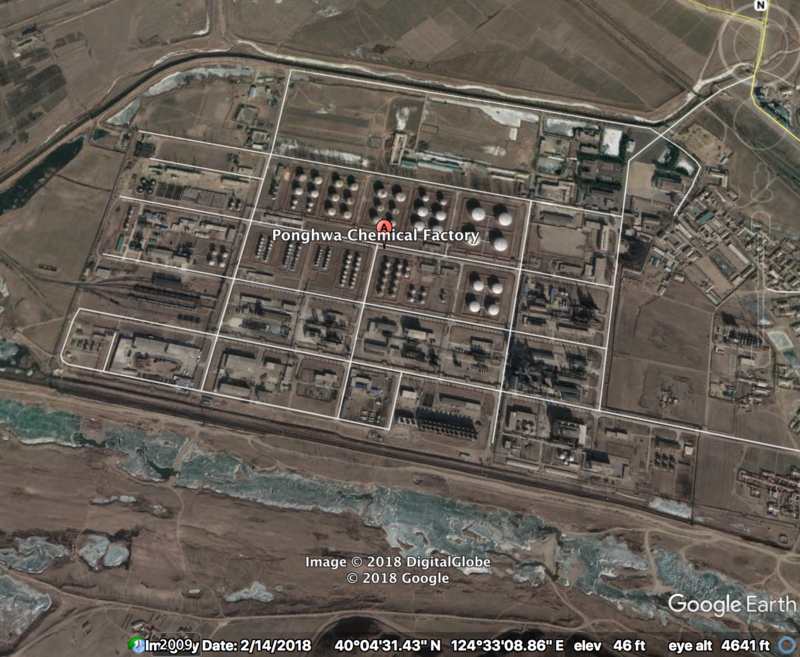 On the theme of energy in Sinuiju, it might be worth noting that the city is home to one of the country’s main oil refineries, the Ponghwa Chemical Factory, south of the city. Ponghwa Chemical Factory, south of Sinuiju. Photo: Google Earth. No sooner do I publish an article on the Sinuiju International Economic Zone (read it here at 38 North) than the DPRK releases more information on it. UPDATE: Dr. Haggard uploaded a nicer version of the image which you can see here. 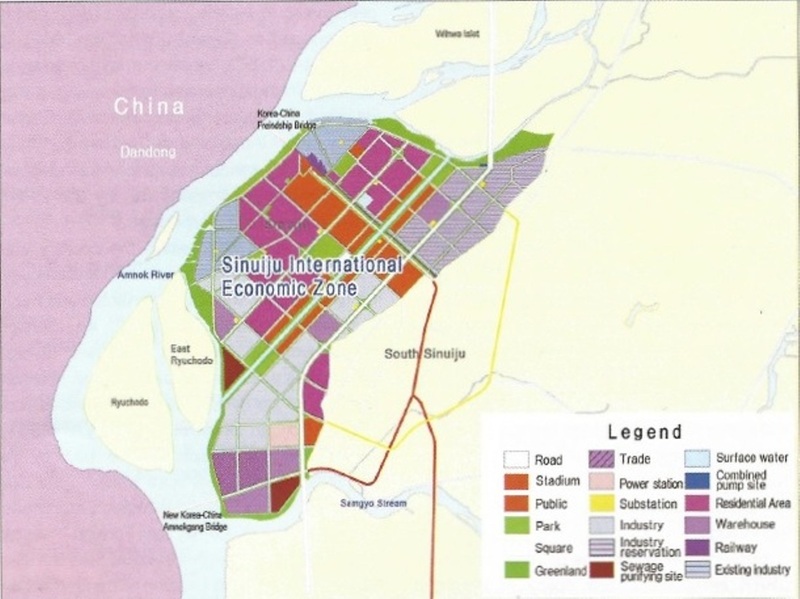 The map indicates that the downtown area of Sinuiju and the western coast down to the new Amnok River Bridge will constitute the first phase of development. Space has been allocated for trade, industry, sewage, warehousing, and other designated areas. The map also indicates a new road is to be built linking the Wihwado Economic Zone (to the north east of the Sinuiju SEZ) with the new Yalu River Bridge (which has yet to be opened for business) and Ryongchon County. Located in a border area, the zone has a bright prospect for the development of water and marine transport. Its development area is 40km2. The Zone is a flat area composed of deposits of organic fine sand in the mouth of the Amnok. The average height of ground inside the bank is 45m, geomorphology is 0-.7% and the average height above the sea level is up to 100m. Its annual average duration of sunshine 2,427 hours, annual percentage of sunshine is 58% and annual average precipitation is 1001.5 mm. The first and second annual main winds are northeast and and north winds respectively. It has the northeast and north winds in winter and southwest wind in summer in the main. 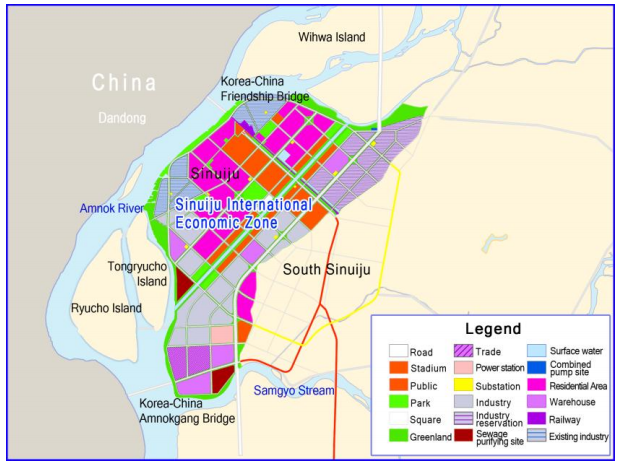 The Sinuiju International Economic Zone will provide opportunity for bonded processing, bonded transportation, trade and financial business, tourism, hi-tech industry, and various other business activities. 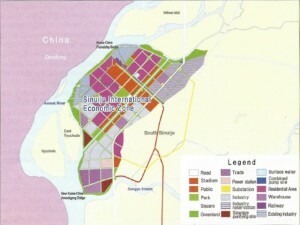 To this end, it is planned to develop the zone into a comprehensive economic zone with a large-sized latest IT industry area, competitive production area, exports processing area, cargo area, trade and financial area, public service area, tourist area and a bonded port, and into an international city with an airport and trade port. Encompassing the whole of Sinuiju and two ri surrounding it, the zone is already furnished with infrastructure. However, it is necessary to upgrade the existing infrastructure and expand its capacity and build in its suburbs on a preferential basis. The items of the construction of infrastructure include port, airport, railways, roads, power station, heating, and gas-supply system, telecommunications (international, domestic, mobile and computer network), and water supply, sewage-treating and garbage disposing systems. As the zone has rich and good workforce whose education level is higher than secondary education, and many competitive heavy- and light-industry factories and enterprises around it, the investment by foreign business will be cost-effective and conducive to its development. Previous posts on the Sinuiju International Economic Zone can be found here. Previous posts on the Sinuiju Special Administrative Region can be found here. The North Koreans have also set up the Sinuiju-River Amnok Tourist Zone which you can read about here. The JoongAng Ilbo has additional information here. Pictured Above (Google Earth): The approximate borders of the Sinuiju Special Economic Zone. Pyongyang, July 23, 2014 17:40 KST (KCNA) — The DPRK decided to rename the Special Economic Zone in some parts of Sinuiju City, North Phyongan Province, Sinuiju International Economic Zone. The sovereignty of the DPRK will be exercised in the Sinuiju International Economic Zone. The relevant decree of the Presidium of the Supreme People’s Assembly was promulgated on Wednesday. Previous posts on the Sinuiju SEZ here and here. North Korea has joined hands with a Hong Kong-based company to develop the country’s northwestern border city of Sinuiju into a special economic zone, a North Korean official said. Sinuiju, which borders China’s Dandong city, has drawn much attention from foreign investors for its geographical advantage as North Korea’s western gateway to China, Ri Chol-sok, the vice chairman of North Korea’s economic development committee, said in an interview in the March issue of Kumsugangsan magazine, a North Korean government mouthpiece. “Now a joint development company has been established for the development of (Sinuiju) and is striving to win back lost opportunities,” said the North Korean official. Hong Kong-based conglomerate Great China International Investment Groups Ltd. reportedly signed the deal with North Korea. North Korea is also making efforts to lure foreign investment to other special economic zones, including one in the Rason area in the northern tip of the country, according to Ri. The foreign company already has deep ties with the North, having joined the country’s project launched in January to renovate the eastern part of the capital Pyongyang. It has been reported that North Korea has established relations with a Hong Kong-based company with the goals of developing Sinuiju, a city bordering China in the northwest region of North Pyongan Province, into a special economic zone (SEZ). Vice Chairman of North Korea’s Committee for Economic Development Ri Chol Sok emphasized the nation’s efforts to attract foreign investors to the Sinuiju economic zone in an interview in the March issue of Kumsugangsan, a North Korean government magazine. Vice Chairman Ri specifically mentioned that, in the past, Sinuiju garnered praise and attention from foreign investors due to its geographically advantageous location along the western border. Ri also announced the establishment of the Sinuiju-Great China joint venture development company, which plans to draw further interest and investment from abroad. It is reported that the Sinuiju-Great China joint venture development company was created alongside a Hong Kong-based finance conglomerate known as Great China International Investment Groups, Ltd. (“Great China Groups”). Great China Groups has recently shown great interest in investing in North Korea and recently began the construction of East Pyongyang Commercial Street this past January. Recent reports from other foreign media outlets have shown that Great China Groups had intentions to invest in the development of the Sinuiju region for some time, but Vice Chairman Ri’s announcement marks the first time that North Korean state media has officially recognized their joint development plans. Meanwhile, the North Korean foreign publicity website Naenara announced that development of an additional economic development zone (EDZ) in North Pyongan Province along the Amnok (Yalu) River began on January 27 of this year. The Amnok (Yalu) River economic development zone will extend 6.6 square kilometers, with construction taking place in Ryongun-ri and continuing up to the Guri and Ojok Islands, where the North Korean border meets the city of Dandong and the Hu Mountain in China’s Liaoning Province. North Korea plans to draw in tourists visiting China’s Hu Mountain to Ojok Island, where an “international services station” will offer food, entertainment, and tourist attractions. There are also plans to develop a modern agricultural sciences research complex on Guri Island that will specialize in flower and vegetable production. North Korea specifically pushed for this location for the development of the Amnok (Yalu) River economic development zone — which will operate autonomously in Pyongan — due to its border location with China. In addition to its desirable geographical location, convenient transportation between the two nations will likely attract more attention from Chinese foreign investors, giving the Amnok (Yalu) River EDZ a higher chance of success compared to other economic development zones. Investments reaching upwards of 240 million USD (approx. 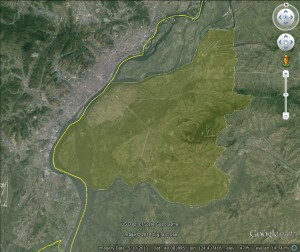 260.3 billion KRW) make the Amnok River EDZ the largest in scale among the 13 total development areas. 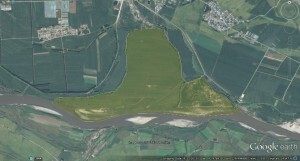 In terms of actual size, however, the largest economic development zone in North Korea is the Shinpyong tourist development zone (8.1km2), located in North Hwanghae province. Apart from the EDZs in the North Pyongan region of Sinuiju, the central government has announced their plans to push forward with two other special economic zones. The Hwanggeumpyong and Wihwa Islands SEZ was announced in June 2010, and in November of last year, plans were revealed to develop an additional special economic zone in the Sinuiju region. All the economic development zones are listed here. Some people say there are 13 of them. 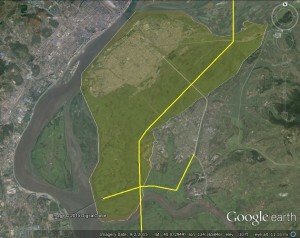 Some people say 14 because they consider the Sinuiju Special Economic Zone an economic development zone. I am in the 14 camp. There have also been at least three other zones proposed that did not make the final list. The Sinuiju Special Economic Zone was announced on 2013-11-21 (the same day as the other 13 EDZs were announced–though in a different article). Besides the Sinuiju Special Economic Zone, the only other EDZ to have reportedly made any progress is the North Hamgyong Provincial Onsong Island Tourist Development Zone. A contract has been signed between North Korea and a Chinese border city to develop a special economic zone in North Hamkyung Province, one day after North Korea removed Kim Jong-un’s once all-powerful uncle from his post. North Korea on Monday signed the contract for Onsong Economic Development Zone with Tumen, a Chinese city under the administration of Yanbian Korean Autonomous Prefecture in Northeast China’s Jilin Province, South Korea’s JoongAng Daily reported Thursday. On Sunday, North Korea dismissed Jang Song-thaek, widely considered the second-most powerful figure in the country, and expelled him from the Workers’ Party of Korea. Jang was accused of “anti-party, counter-revolutionary factional acts” and womanizing. Considered an economic reformist, Jang led a delegation to China in August last year to discuss the development of two economic zones in Rason City and the Hwanggumpyong and Wihwa islands near the Chinese border. An official from Tumen said the city government expressed concerns regarding possible postponement of the contract signing due to Jang’s ouster, but North Korea requested they sign the contract as scheduled, according to the daily. North Korea was in the process of forming the new National Committee for Economic Development earlier this year, which technocrats who had prior experience with the nation’s former economic development bureau, will have joined, Kim Kyu-chol said. North Korea also reached an agreement with China on Sunday over a 380-kilometer high-speed railway to connect Sinuiju, the city across the border from Dandong in Liaoning Province, through to Pyongyang and Kaesong, South Korean Democratic Party lawmaker Hong Ik-pyo told a seminar at the National Assembly. Pyongyang’s insistence on inking the contract sends a signal that its economic ties with China will not be affected by Jang’s dismissal and that North Korea wants to strengthen cooperation with China, said Jiang Longfan, a North Korea expert at Yanbian University. “Kim wants to consolidate his absolute authority through purging Jang, but in the meantime the commitment to economic development has to be maintained to win people’s support,” Jiang said. Sinuiju Special Zone located at the estuary of the Yalu River is expected to see the ground-breaking of a major project in February next year, with backing from Hong Kong. North Korea also signed a contract with investors from Singapore, Hong Kong, and the Chinese mainland to invest in the Kangryong Green Development Zone in South Hwanghae Province in mid-November, Tongil News reported on Tuesday. The Onsong Economic Development Zone is one of the 14 special economic zones North Korea has designated this year to attract foreign investment. North Korea planned to develop the zone into a tourism resort that includes a golf course, swimming pool, horse racing, and restaurants to attract foreigners, said Jin Hualin, an expert on North Korea economy at Yanbian University. “But the exact development agenda hasn’t been set as Tumen will invite investors to make their decisions,” he said. He is optimistic about the economic prospects for the zone, which, located in mysterious North Korea, will be attractive to foreigners, he said. Next year, North Korea aims to host 1 million foreign tourists and thus further tourism projects are expected to be announced, Kim Kyu-chol said. Some 250,000 foreign tourists, more than 90 percent of whom were Chinese, visited North Korea last year, Kim said. North Korea is pushing ambitious development of local economic development zones, purportedly with the aim of promoting balanced development of the local economy and improving the lives of ordinary people. To enhance the effectiveness of the EDZs, each region’s characteristics were incorporated into the development strategy. The existing Rason and the Hwanggumpyong Special Economic Zones are comprehensive and large in scale, covering production and processing, transport, commerce, and tourism sectors. The local-level EDZs, on the other hand, reflect each area’s local economy and culture and more narrowly focus on local industries. For example, the EDZ slated for Pukchong in South Hamgyong Province is an agricultural zone; Onsong in North Hamgyong Province is for island tourism; and Waudo in Nampo City is an export processing zone. He one reflects its region’s characteristics. In addition, each province was encouraged to develop plans according to the region’s environment and apply to the People’s Committee in each province. Plans were then sent to the State Economic Development Commission for in-depth deliberations. North Korea has upgraded the State Economic Development Commission (from its previous designation as the State Economic Development Board) in October 2013 to become a direct mechanism under the Cabinet that oversees the establishment and management of EDZs. This commission is responsible for developing national strategies relevant to special economic zones such as selection process of provincial EDZ establishment, preparation to state evaluation, modification and supplementation of laws and regulations, and the entire process for implementation. The Choson Sinbo reported that while some might take a pessimistic outlook on the new EDZs, the new project is attracting interests from various countries such as Hong Kong and Singapore, and the local and central governments are working closely to promote this project. You are currently browsing the archives for the Sinuiju International Economic Zone category.